Here are a few tips when working on your watches. Although mainly Seiko-centric, many of these tips can be applied to other watches. I have found that there is very little info online about how to work on your own watches. Most of us just want to change hands/dial, adjust our bands and leave the rest to the pros. Taking off a bracelet or strap springbar. Many people use a small blade on a pocketknife to take off the springbars. This does work and it's fairly easy to use. However, I recently got one of the good springbar tools from Ofrei and now it's really easy to take springbars off. Highly recommended! One ironic part of the tool is that the most used tips (for me) are on the same end. I rarely use the larger tip, but that's probably because I hardly use leather straps. One of the more stressful parts of removing a movement for a beginner is how to remove the crown and stem. There's too little information online on how to do this. 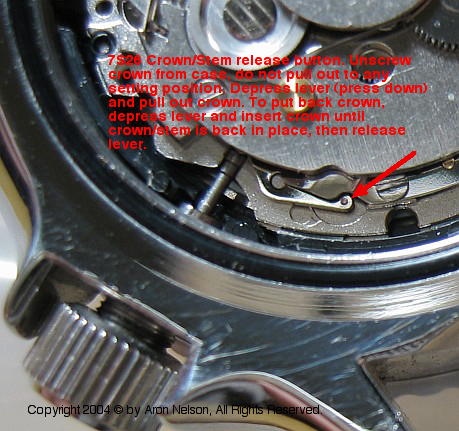 On most of the movements found in Seiko and Citizen, you need to press down on a lever in order to remove the stem/crown. You also push on this lever to put it back in. Here are some pictures of different movements showing where to press. Note: if you don't do this properly it's possible to jam up the keyless works (the part that handles the hand setting etc...). BTW: as far as I know, you always PRESS and do not lift anything to get the crown/stem out. You push the lever to remove AND insert the crown/stem back in. Some movements you can get away with having to push the crown/stem when re-inserting, but don't do it. Press the lever when putting the crown/stem back in. The 7002 movement is similar to the 7S26. Pull out the stem to the setting position and notice the lever pops out just like the 7S26 (when facing the back, with stem to your left, the lever is right above where the stem enters the movement). Press it down and the crown/stem will come out. I have found my 7002 to be pretty tricky to put the stem/crown back in. It always takes me several tries. On most of the digital watches, there is either a lever (with a dimple on it) to press, or a hole that says "PUSH" next to it (sometimes with an arrow). Once you press the lever or button (in hole), the crown will easily come off. Once that's out, the only other thing holding the movement in place is a plastic spacer. Simply remove this spacer and the movement will come out. There is a trick to some of these digitals. For example, I was working on a 7A28 movement. There was PUSH and a hole there but nothing to push in the hole. What I did was pull the crown out to different setting positions and then I was able to notice that the level appeared only in one position. Once I saw the lever, I was able to push down on the lever and the crown/stem came out. So try putting the crown in different setting positions and you will probably see the lever you need to push in one of the setting positions. For mechanicals, most times after removing the crown/stem, you can simply turn the watch over and the movement will fall right out. I use watch paper in one hand, place it over the movement side and then turn the watch over (so the crystal is facing up). The movement will usually come right out on top of the watch paper. Sometimes you need to tap onto the crystal a few times (with your finger) to have the movement come out. Other times (like with my SKX779), you need to gently pry on the spacer to get the movement loose before turning the watch over. It all depends on the watch. 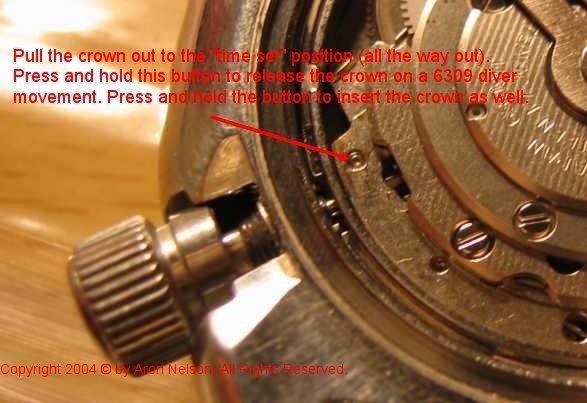 The 7A28 movement: Pull crown out to the hand setting position (all the way out). Note the hole that says "PUSH" and the lever with the dimple will be visible in the hole. Press down on the hole and take out the crown/stem. Press the lever to re-insert the crown/stem. Once you work on a few different movements, it will become fairly easy to find the lever or button to press to release the crown/stem. 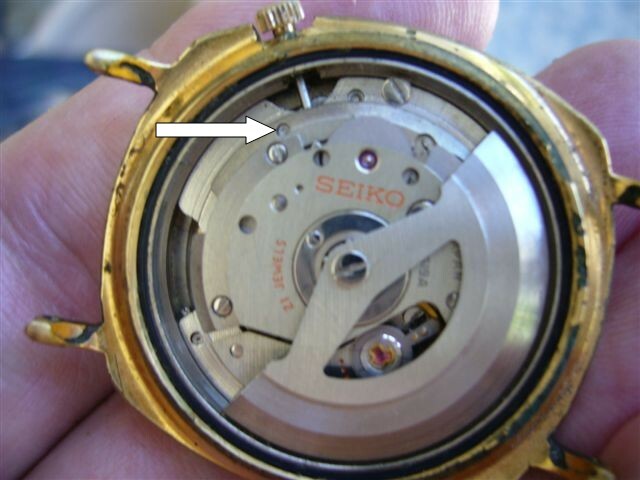 Other types of movements have a screw located close to the crown/stem. A note about the pushers in a chronograph. There may be a small plastic "U shaped clip" that prevents the pusher from coming out of the watch. Be very careful not to lose this little piece of plastic. If you have to work on small parts that could "fly away", work on them in a plastic bag. If you lose this U clip, a chrono gasket works well and in fact may be an improvement for water resistance. Those small pieces in watches cannot take much force at all. If you find yourself getting frustrated and forcing things, then something's wrong. Take a break and rethink what you are doing. If you have to force too much, something's wrong. 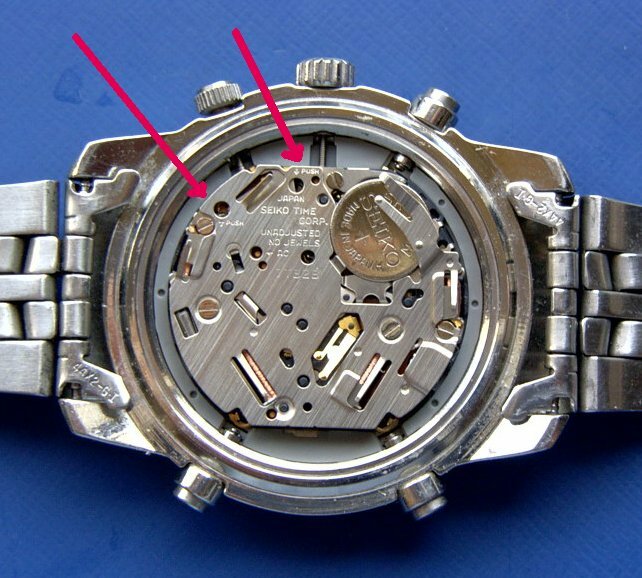 The SCF (Seiko Citizen Forum) tip on placing tape on the back of the watch case before using the caseback remover tool does work and does help reduce scratches. The best prevention is to adjust the caseback remover tool so it fits well into the caseback and use a case holder. Here's a [thread] regarding caseback tools. I have had limited success taking off loose and crusted lume by picking it off (gently!) off of my old Seiko dials. Assuming the existing lume is not radioactive and hands are not painted, to take lume off a watch hand, try acetone. 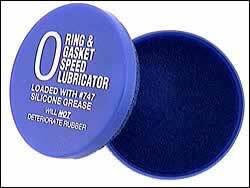 You simply drop the hands in a container and swish it a few times in acetone and the old lume will come right off. I have done this and it's pretty tough. You need to be really careful when taking the lume off of hands that are painted. Some of the "fake" lume is really sticky, tough paint. Use pegwood or toothpick (round) to remove the lume and place the hand flat on a surface. Do not hold the hand via the hole and try to pick off the lume. You will only bend the hand and possibly break it. I use a flat toothpick and I dip it into the lacquer and put drops into the mixer bowl. I count the number of drops and then use another toothpick to put approximately a little less lume into the mixing bowl. I then mix the lume and test the viscosity. You want it to flow off the oiler smoothly. Once it starts getting too thick forget using it, make another batch. OK, here's the deal. Use a flat toothpick - wider side to dip into the lacquer. Don't dip the whole end, but just the tip of the flat-wide part. Count 3 drops into the bowl. Then do the same with another toothpick for the lume powder; however this time put about 2 measurements (so a 2/3rd mix). Mix well. It may look like you put too much into the bowl, but the mix will last longer (not get too thick quickly) and the mix will flow off of your oiler easily. All the problems I have had was when I was trying to be too frugal with the lume. The lume would set too quickly and gel up. YES, this way you will end up with some lume left in the bowl, but it's better to waste some lume than to ruin a hand etc.. because of too thick/gummy lume. Buy a whole box of flat toothpicks and you will never have to worry. Also, wipe off the bowl with watch paper. You put the lume on the bottom of the watch hands after you have removed the previous lume. Believe me when I say it's pretty darn difficult to paint lume over the existing lume from the top (when the lume is in a "slot") unless you are very good at luming. It is possible and I have done it, but not for the entire length of the hand. Most lume is in fact applied from the bottom. Use an oiler and apply from the bottom allowing the lume to fill in the holes. Suspend the hand upside-down with a round toothpick that is stuck into Rondico (one side in Rondico, other side in hole of hand), then apply the lume to the bottom of the hand (which is now facing upwards). You can use a larger sized oiler for this operation. For hands that are mostly white, you can put watch paper under the hands and paint the lume right onto the hands. You don't have to remove the hands from the watch if you are going to paint the entire surface of the hand with lume. There is a technique that I have been succesful with. I have found that there is a motion that my hand is the most steadiest moving in. You will need to find that motion. In my case it's in a motion toward me. It's almost a straight line so what I do is rotate the movement so whatever I am luming fits that motion. Do not force your hand in an un-natural motion to the movement, move work so it fits your steadiest movement. That way you will have the least amount of mistakes. The only way I have found to take the lume off is to let it dry and pick it off. Apparently you can try and use a second oiler to try and wipe it off when wet but I haven't been able to do this easily. Lume WILL dry and become less thick height-wise. As it dries, it will reduce and become less sticky. Let it dry before testing it in the watch. Let it dry at least overnight otherwise it may be sticky and be too thick and could touch the crystal. Small hands so far do not glow long enough to make it worth luming. You need a significant amount of lume to make the hands glow all night. In my opinion the small hands will not allow enough lume to make it worth the trouble. If the small hands are paintable without removing it might ok to try this. Put watch paper under the hands between the hands and the dial to protect from any spills and apply luminova sparingly. As far as I know, Super Luminova is the best lume to use on a watch. Other brands are just not as good. [Ofrei] carries it. There are 3 bottles in the kit. The thicker one is the lacquer, the white is the luminous powder and the thinner one is a thinner for mixing with the lacquer if it becomes too thick. You use the lacquer and luminous powder for the main mix. The black "applicator" is an oiler for applying the lume. I have read that nail polish is great for painting the hands of a watch. It does work but do not use the brush that comes with the nail polish! It's much too thick a tool and will not work well. A smaller brush or an oiler should work much better. Different brands of nail polish apply differently as well. Update 5-1-06, after testing with nail polish, I wouldn't bother with it. Go to a model supply store and get Tamiya Acrylic paint. Easy to use and it works! While you are there, pick up a good brush at the model supply store. It works! There are dedicated tools for removing and setting hands. However I have found that the hand setting tool works well with the thicker "divers-style" hands and doesn't work well for the more fragile second hand of the thinner variety. Therefore, I suggest trying tweezers to set the second hand. The nylon end of the typical hand setter is too broad for some delicate second hands. On the other hand, if you use tweezers, it's very easy to scratch the hands with the tip of the tweezers so some thought needs to be put into this. I have had success using the flat side of the tweezers to gently press down the second hand evenly. What hands fit? Seems like most Seiko mechanical movements will interchange hands [see this post]. Another common question is dials. 7S26 dial will not fit other movements like the 6309 or 7002 without modification. Apparently some people have figure out how to cut off the dial feet and attach them to some sort of movement ring. I haven't figured this out yet. Another thing is that the standard second hands seem to fit the chronograph second hands as well. I was able to put a 7S26 second hand on my 7A28 chrono for use as a chrono second hand (original was no good). I have seen lots of posts with people using cleverly devised methods for pressing a crystal or bezel etc... 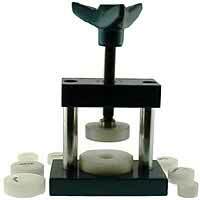 However, with a low cost press, you get even distribution of pressure and it's just so easy to use. It's easy to pop out or put back in a crystal or bezel. I can't imagine using a makeshift device for crystal or bezel setting when this device is so affordable. The 7002-7000 diver does not have a crystal retaining ring like the 6309, rather it is more similar to the SKX007 where the crystal is pressed into a crystal gasket. To take out the chapter ring, you must take off the bezel (using a knife etc...), then press the crystal out and then you can take out the crystal gasket and the chapter ring. In my experience, removing the crown/stem and handling the second hand have been the major bummers of customizing my watches. The second hand is extremely delicate and can bend/break very easily. The crown/stem is very easy to remove IF you know where to press. If you don't know, it can be frustrating and can easily jam up the movement. Sometimes even the replacements don't help. I ordered a replacement Citizen second hand. Guess what? They stapled the bag to the receipt so when the receipt was pulled out, the hand broke in half! I had the great idea of reluming my SKX007 type hands to "white" luminova. I used the acetone method to take off the lume and it was squeaky clean really fast. However I never expected that it would be so difficult to get the lume to fill the hole in the hands. The viscosity of the lume is not thick enough to fill and stay filled. I need to try a toothpick and perhaps mix it thicker. I used a large oiler and it did fill the "arrow" part of the hand but not much more. Update: I am still having a pretty tough time with this. I tried to make the lume thicker and use a flat toothpick. It worked but the lume bled through the hand onto the top. Hmmm, ok, the last thing to try might be to apply the lume from the bottom with the top of the hand facing up. I was trying it with the "top" of the hand facing down and applying the lume from the top. Update: 5-1-06 I got it to work. I used clear Tamiya acrylic paint (model paint). I then mixed the lume and paint together with a toothpick checking my watch until it thickened. For my testing at around 9 mins 30 secs, it started to thicken and at 10 mins, it was just right. It was easy to apply over the hands at that point. I suspended the hands upside down with round toothpicks (in the holes) and then painted the bottom of the hand smearing across the gaps in the hands. It worked fine. Update 6-06 This DOES work and work well. My 2nd time, I waited around the same time and it was very,very easy to apply the lume on the back of the minute hand. Perfect results and on the first try. OK, I tried the glue trick and it didn't not work for me. The glue started becoming a ball and didn't seem to mix with the laquer. Short answer, it didn't work for me. Red tipped hands: Piece of cake. All I did was dip my oiler into red Tamiya paint, then slide it across the tip of the second hand. Really, really easy. Some other colors to try are blue or yellow. Remember to use your loupe when doing this. I installed a sapphire crystal into my SKX779 (Black Monster). It went perfectly except after a while the watch fogged up. I couldn't understand it, the seals looked good... What could be the problem? I opened the watch out again and the same thing happened. After talking to Bill Yao, he asked if it was unusually humid lately and darn it, he was right! I opened the watch up in an air conditioned office and closed it back up. NO MORE PROBLEMS! Polishing Titanium (untreated). Untreated titanium can be polished with a pencil eraser! Just rub in the direction of the "grain" and it will polish out scratches. The green scotch brite pad can be used as well. Untreated titanium is apparently very soft. Pretty slim pickings for modifying your own watches. Here are places that I have personally dealt with and have found to be excellent! Editing of the watch wiki has been suspended due to spammers.